Olafur Eliasson (b. 1967) studied at the Royal Danish Academy of Fine Arts. He represented Denmark at the 50th Venice Biennale in 2003 and later that year installed The weather project in the Turbine Hall of Tate Modern, London. Take your time: Olafur Eliasson, a survey exhibition organised by San Francisco Museum of Modern Art, travelled to further venues until 2010. His solo exhibition Innen Stadt Außen (Inner City Out) opened at Martin‐Gropius‐Bau in 2010, with interventions across Berlin providing a public dimension to the show. Eliasson has engaged in a number of projects in public space, including Green river, carried out in various cities between 1998 and 2001; The Serpentine Gallery Pavilion 2007, designed with the architect Kjetil Thorsen; and The New York City Waterfalls, commissioned by the Public Art Fund in 2008. As professor at Berlin University of the Arts, Eliasson founded the Institut für Raumexperimente (Institute for Spatial Experiments) in 2009. Seven celebrated ‘artists’ who will mentor seven young artists in 2014-15 are announced, including Olafur Eliasson for visual arts. 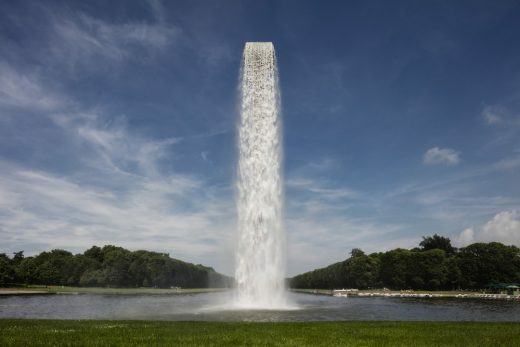 Danish-Icelandic artist Olafur Eliasson is best known for his large-scale installations and sculptures that employ non-traditional materials such as water and light. In 2003, he represented Denmark at the Venice Biennale. Harpa’s opening celebrations begin May 4, 2011, and run through August 20, 2011 when the building is inaugurated and the façade is illuminated during Reykjavík’s Culture Night. Harpa’s façade was designed by renowned artist Olafur Eliasson and Henning Larsen Architects, the building by Henning Larsen Architects and Batteríið Architects, and the performing arts venues acoustics and theater design by Artec Consultants Inc. Harpa is a landmark in the redevelopment of Reykjavík’s historic harbour and waterfront area, and a symbol of Iceland’s renewed dynamism.